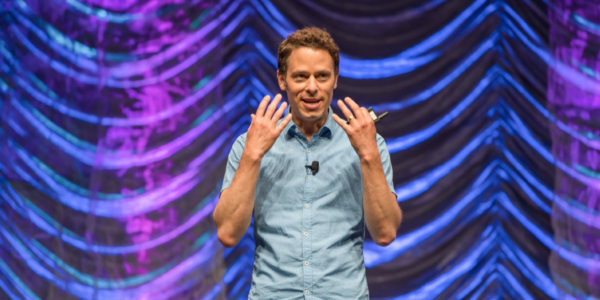 Telling a story isn’t difficult, but “whoever tells the best story wins,” said Matthew Luhn, storyteller, consultant, and former Pixar story artist. Luhn, who was the opening main stage session presenter and was introduced by Mark Oster, national managing partner, not-for-profit and higher education practices, Grant Thornton, reflected on how his childhood helped shape his career trajectory and encouraged business officers to use their own personal stories to engage their stakeholders, and leave positive and lasting impressions. Growing up as a son of toy store owners, Luhn was surrounded by toys, but it wasn’t the access to them that inspired his creative journey. Instead, it was his father’s encouragement to draw, and to draw often. Finding his niche in the writer’s room at Pixar, Luhn found out that storytelling was his passion. Through his work as an animator, Luhn has learned how to tell captivating stories, but besides knowing how to tell a story, he has tapped into the importance of a good story. “Storytelling is a powerful way to make a connection,” Luhn said. Moreover, “storytelling ends up improving our memory; when you share a story around information, people retain it better.” When it comes to data and statistics, if there’s no story attached, people will only retain 5 percent of what you tell them, so the goal is to ensure that your audience retains the information. Luhn noted that telling a story goes beyond what’s said verbally, and includes visual aspects. Drawing a parallel to Tiffany & Co., he pointed out that the jewelry retailer has consistently used a specific color and font that invoke a pleasurable experience and has made the brand memorable. Business officers should also remember to include these minor, but important, elements into their storytelling presentations. “The most powerful way to share a story with people is visually,” Luhn said. Statistics show that people make decisions based on what they see within the first 90 seconds because color and design trigger emotions. Acknowledging that higher education finance is a world away from animation, Luhn offered tips that can help business officers make an impact when communicating with peers and institutional leadership. Tap into emotions. “Impact people with the rise and fall of a story,” Luhn said. There needs to be an up-and-down cycle that keeps your listeners engaged. Whenever you share a story or anecdote, and you express it in a positive and happy way, you release dopamine—a neurotransmitter in the brain that helps regulate movement and emotion—in your listener. However, what people enjoy in a story are the ups and downs. When you are sharing something that is sad, it creates empathy and generosity. Oftentimes, leaders want to share the good news and information, but when they share the highs and lows, it makes them more authentic and relatable. “The reason why we love heroes in a movie is not because they succeed all the time; it’s because they also fail and never give up,” Luhn said. The same principle should be applied in a business setting as well. Trust. This is simple, yet important. Along with inspiring people, you also want to make sure that your products and services are good. To continue having a strong brand, people need to know that what you are “selling” is good. It leads to people building their trust in your offerings. Luhn also shared five steps to help business officers develop inspirational stories. 1. Have a great hook. The attention span of the average human is eight seconds, Luhn said. Therefore, the beginning of your pitch, the opening line on your website, or the start of your presentation should immediately capture the reader or listener. How do you grab someone’s attention in eight seconds? The hook can be one of the following: unusual, unexpected, action-based, or a conflict. Once you establish the hook, the very next thing people want to know is “how is this going to change me?” Consider what is the potential for change, because great stories are about transformation. 2. Make a connection. Think about the stories you can share that connect you with the audience. Make sure that you do your research to know your audience and then find the information that can connect you to them. 3. Make it authentic. Don’t be clever, speak from the heart, and be vulnerable. Honesty lets you connect with the listener. Never tell people the theme of your story. You want people to feel the theme through what you’re saying. 4. Create a structure. Luhn pointed out that in every good story, there’s always a main character. This character has gone through a complete journey, which includes the setup, build, and pay off. If a story does not include these three elements, the audience will begin to lose interest and not pay attention. An easy way to keep on track of this is to always put a story together using the beginning, middle, and end template, also known as the story spine. 5. Add the bookend. As you reach the end of your presentation, bookend it with the same personal story that you shared in the beginning, or a success story related to the topic at hand. This lets you make one final connection with your audience, allowing them to easily retain all the information that you have presented. 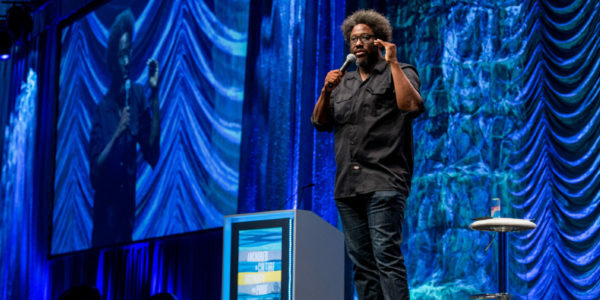 On Monday, July 23, in a highly provocative keynote full of humor, critically acclaimed sociopolitical comedian W. Kamau Bell spoke about racism in the United States, challenging attendees’ thoughts and attitudes about this issue. Bell was introduced by Erin Gore, executive vice president, Wells Fargo. “The thing about racism is that people are used to only having conversations about headline-grabbing issues, but there’s racism at all levels,” Bell said. “We need to go to people who think it only happens at a high level, and bring them in for lower-level conversations.” We need to be able to start with small discussions, and then move on to bigger discussions. It’s the responsibility of white people to listen to people who are more advanced in talks and discussions about racism, he said. While talking to a smaller group of attendees in a follow-up continuing-the-conversation session, Bell said that “we have to be able to have all sorts of conversations. You can’t say I am an accountant and I talk about accounting.” Just because people are in a certain profession, it does not absolve them of their responsibility to have conversations on such topics. Having discussions on racism is difficult, and people will and should feel uncomfortable, but this will lead to progress on the issue. Having difficult conversations. So how can people start such conversations? You need to be clear and proactive about the conversation, Bell said. Choose a day, and plan and prepare for the awkward and difficult conversation. Avoid having the conversation in the heat of moment. The other side has to be in a position to receive information as well. Promoting free speech. “Campuses are designed to be safe spaces, but they are also spaces for producing free speech,” Bell said. Free speech is messy and complicated. The issue is that a lot of times, colleges and universities think that they have to stay out of those discussions and let free speech just happen. But we have to understand that free speech is not free of consequences. Some free speech encourages violence; some free speech encourages inclusion. Institutions need to do a better job of understanding what productive free speech is, because it encourages more conversation, more thought, more equity, and more inclusion. Turns out, we’re all doing it. Aging, that is—and Jane Fonda has plenty to say about that. During her conversation closing the annual meeting, the American actress and activist shared the fear that previously haunted her about growing older. Now in her self-described third act, Fonda, who was introduced by Salli Darden, vice president, marketing and communications, Chartwells Higher Education Dining Services, embraces the insight that comes from years of self-reflection and identifying what makes her whole. In many respects, Fonda’s approach in life has mirrored her method as an author: “When you are afraid of something, study it. Learn as much as you can.” Get to know inside and out the thing that you don’t know because “the only way to know what to do about something is if you understand it,” Fonda said. She admitted that her books have largely been an act of self-discovery. Fonda wrote My Life So Far (Random House, 2005) about women coming of age while in her mid-40s because she “wanted to be prepared.” Then in her early 70s, Prime Time (Random House, 2011) became her vehicle for exploring how to age gracefully. At 80, Fonda is convinced that those earlier exercises in retrospection have made the start of her latest decade more vibrant and meaningful. Here is a handful of the gems on aging that Fonda has discovered and has made her mission to share with others. Reach for your potential. In truth, many Americans today are living on average several decades beyond the life span of their grandparents—an entire second adult life not enjoyed by their predecessors. Yet, many slide into a traditional retirement zone without having come to terms with what to do with that extra time, Fonda said. That lack of knowing how to fully live out one’s “golden years” is exacerbated by an outdated paradigm of life as pathology—an arc on which you are born, then mature, and then decline. Today, many in the medical and artistic fields in particular are reassessing these final decades of life as a unique developmental stage that is as different from midlife as adolescence is from childhood, she added. This third act can become “an upward ascension of one’s human spirit to wisdom and authenticity”—life as potential, Fonda explained, not merely the next pathological phase. Acknowledging your luck can also lead to understanding the power that you have to help others. In part because of her fame, Fonda sees her role of celebrity as one of a radio repeater—picking up the stories of those most vulnerable or unheard, and transmitting and expanding the reach of those voices across a broader range of conversations. In fact, Fonda’s zeal for political activism has spanned her adult life. “I’ve been knocking on doors for 45 years,” she said. While the causes behind her activism have evolved over time, Fonda’s commitment to lending her voice for change has remained constant. Most recently, her focus has been to amplify the plight of farm workers and women trapped in isolating, low-paying jobs. 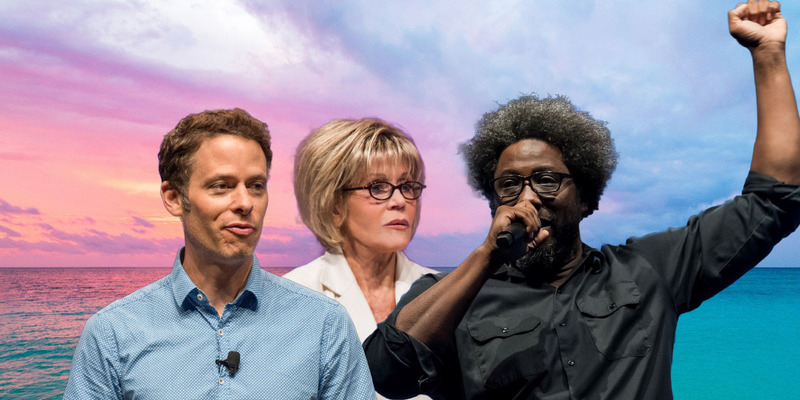 Off screen this fall, Fonda is teaming up with on-screen co-star Lilly Tomlin on a voter registration push and in support of the grassroots movement One Fair Wage, which advocates on behalf of restaurant industry workers in particular. Finish what you start. Regrets are usually for the things that you didn’t do during your first two acts. “I believe that the main purpose of our third act is finishing the task of finishing ourselves. Knowing where we’ve been, we can tie everything together to make sense of how to live the rest of our lives,” she said. This requires intention and commitment to revisit your past to better understand your previous attitudes and behaviors, so that you can change them going forward. And, when your future becomes shorter, you know what you truly need and what you can get rid of, Fonda said. “There is less ego at stake.” Part of the art of growing older is knowing what to overlook. See “The Art of Storytelling” in the April 2018 issue of Business Officer to learn more about Matthew Luhn’s thoughts on becoming memorable and impactful communicators. In a continuing-the-conversation session for community college attendees, Howard Teibel, founder and president, Teibel Education Consulting, Boulder, Colo., interviewed Matthew Luhn to discuss further the importance of storytelling, and how community colleges can use success stories to promote their institutions as a viable learning option. People don’t like to change; it’s scary and they want to do things the way that they have always done them. To connect, share with them an anecdote or experience. Everybody has lots of stories to share. Take people through the moments that have been unique and special to you. Find a theme in that story—teamwork, change, innovation, etc.—and share it with your audience. For example, instead of explaining how to pivot, tell a story about how you pivoted in your life so that the idea of pivoting will resonate with the listener. The key to storytelling is about opening up and getting personal. An important part of the job is for CBOs to be able to work across the aisle. What advice do you have for people who speak in front of a group with a different objective or perspective? There are three things that I would recommend: (1) Use more story examples and don’t be too abstract. (2) Know your audience so that you can balance between personal stories and abstract references. (3) Know what’s important to your audience. How do you create a positive image of a two-year college? One of the best things that you can do is share positive stories of the community college experience. Those stories are a great way to build your credibility. Let people know that this isn’t just a gateway to an Ivy League or a four-year degree. Share the stories of people who graduated from two-year colleges and have reached their dream without completing a four-year degree. Share positive testimonies. When people see that others have done it, they will be encouraged to try it as well. How do you bring a character into the story about a key message that you have? Your audience is the hero in your story. You want to think about the person you want to connect with and make that person the hero. In a story, the hero typically gets help. Be a mentor to the hero in the story, but also become an ally. Your students or your teams are heroes and you are the mentor. Provide the tools to help your audience navigate. See “Keep Calm and Listen On” in the May 2018 issue of Business Officer to learn more about W. Kamau Bell’s tips on having difficult conversations. 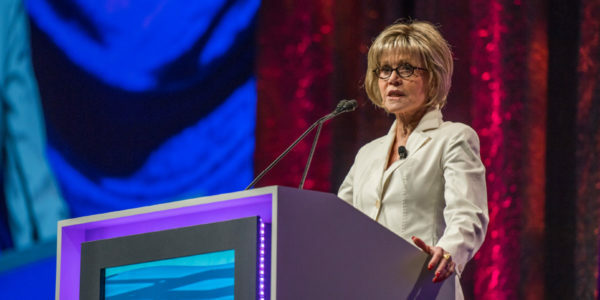 See “3rd Act” in the June 2018 issue of Business Officer to find out Jane Fonda’s ideas on leading a fulfilling life after retirement. Join us for The Medici Approach: Harnessing Differences to Drive Innovation, an online event on Wednesday, November 7, at 1 p.m. EST. Based on the NACUBO 2018 Annual Meeting session, Diversity Drives Innovation Workshop™, you will learn how to unlock enormous potential within your teams. Institutions that bring together groups that reflect many different facets of diversity, including cognitive, cultural, and functional, can create unexpected collisions that drive serendipity and super-charge a team’s ability to innovate with speed. Learn more at www.nacubo.org/ELearning.